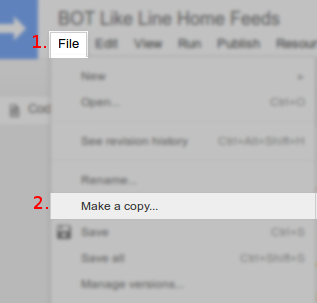 Here is a Google apps script to automatically liked post on your own home feeds / timeline. Click on the link above and sign in with your Google account. Open "File" menu, choose "Make a copy". Replace "nama" values with your name and "kuki" values with your LINE account cookies (read instructions) etc. How to get LINE cookies in the next step. You may need to run a function "cekAkun()" to check whether the account is valid. Then check the log when the function was run. You can set the script to run automatically by setting the "Current project trigger" on the "Resources" menu. First, you must allow your LINE account to login via PC (in the next step). Go to https://timeline.line.me and sign in with your LINE account. Copy the value of cookies in your browser. Network > Choose one request at a domain timeline.line.me > Headers (on the right panel) > Request headers > Copy the cookies value from "Cookie" request header. Go to More > Settings > Account. You can also open this menu by tapping this link from your smartphone. To set emoticons of like (default: null, if you want to set the emoticon randomly). Change the null value of the variable 'tipe' (on line 9) with numbers above if you want to change the type of emoticons like.